In the glass, Trumpetor is dark purple and offers a nose of sour cherry jam with allspice. With air and a little time, this evolved to blackberry and cherry salsa without the heat. Taste was certainly not peppery or presented with any alcohol burn on the back palate. In fact, the wine was fruit forward with blackberry, plum and hints of pencil shavings and bacon fat. As its higher priced (but still bargain respecting cousin “Encuentro”), Trumpetor is silky and lush in the mouth due to 100% malolactic fermentation. Grapes are 100% estate grown and hand-harvested from Rutini’s Tupungato vineyard in the Uco Valley in Mendoza (Argentina). The wine is 100% Malbec. With each wine I taste and write about, I’m reminded of Pliny the Elder’s quote: “The best wine is that which tastes good to thine own palate.” If “chewy” Cabernet Sauvignons or moisture-sucking Petite Sirahs are your style, you might not be enamored by this style of Malbec. 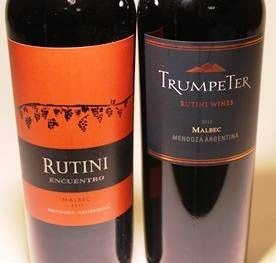 Rutini’s “Encuentro” Malbec might be more to your liking, though that too is “new world” in style albeit less fruity. world is bigger than me. I was reminded of that again when my friend said she preferred the “Trumpeter.” She enjoyed its softer, fruit-forward profile and simply that it was easy drinking and enjoyable. Apparently, she has lots of company. 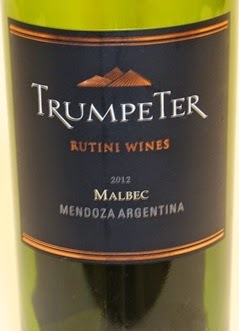 Rutini’s Trumpeter has been Argentina’s “Best Buy” for over 15 years. With a suggested retail price of under $11, even I can appreciate that. My instincts tell me that this is a crowd pleaser in a mixed group getting together for good times. Follow Wine Mizer on Facebook for mini-reviews, fun facts, recipes and more. · Sample provided by publicist for review.